US President Barack Obama will urge EU leaders to keep sanctions in place against Russia at the G7 summit in Germany, US officials said. The US says it needs to “maintain the pressure” on Moscow. 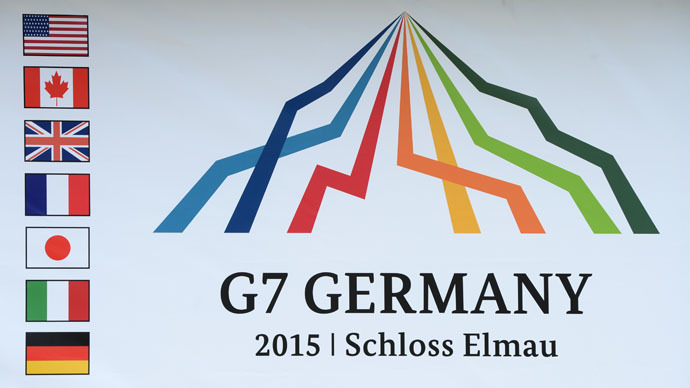 The G7 nations will meet in Bavaria, Germany for a two-day summit beginning Sunday. White House spokesman Josh Earnest said that the sanctions imposed on Russia will be on the agenda. "My understanding is that the plan is for the President, when he goes to Europe, is to have a discussion with fellow European leaders about the need to extend the sanctions regime that's currently in place that I believe expires sometime at the end of this month," Earnest said in his daily press briefing. "I would acknowledge that we have not yet seen the kind of change in behavior that we have long sought now," he added. Charles Kupchan, the White House Senior Director for European Affairs, confirmed that meetings at the summit will be centered on the US and Europe putting pressure on Moscow. “The President will be making the case to his European colleagues that the EU should move ahead and extend sanctions when they meet at the end of this month,”Kupchansaid. The US has criticized Russia recently for an increase in fighting in Eastern Ukraine. However, on Thursday, the Kremlin released a statement saying that the tensions, which had been stoked by Kiev, were increased to coincide with the upcoming EU summit, which is to take place in Brussels on June 25-26. "Yes, indeed, in the past Kiev had already heated up tensions amid some large international events. This is the case, and now we are seriously concerned about the next repetition of such activity,” Kremlin spokesman Dmitry Peskov said. However, rather than further looking to sideline Moscow, German Chancellor Angela Merkel says that it is essential to continue cooperation with Russia in a number of key international questions. The Obama administration says that the longer the sanctions are in place, “the more of an economic bite they take out of the Russian economy.” However, the sanctions are also having a negative effect on a number of EU members who have been hurt by Russian counter-sanctions. “I think these sanctions are affecting Europe much more as a whole than was expected, and the others on the other side of the Atlantic are not affected at all,” said former Italian Foreign Minister Franco Frattini, who spoke to RT in November. Some EU nations are becoming wary of introducing further sanctions against Moscow. During a visit to Moscow in March by the Cypriot President Nicos Anastasiades, he stated: “[Russia and Cyprus] will cooperate without paying attention to who is reacting or who may have concerns,” according to CNA. The current EU sanctions expire in June, after which time the bloc will hold a vote on prolonging them. However, a Russian politician, Leonid Kalashnikov, says he is confident that the bloc will not look to impose further measures against Moscow as it will not be in their interests. “As far as new sanctions are concerned, now I am sure that Europe is very unlikely to impose them, because there are nations that would not agree to this – Greece, Cyprus, Hungary and Italy. And if even a single nation does not agree there would be no decision, such is the voting procedure,” Kalashnikov, the deputy head of the State Duma’s committee for international relations, told the Izvestia daily. Kalashnikov also said that almost daily meetings are held in the State Duma with foreign politicians who are trying to find a way to resume dialogue with Russia. In February, Spain evaluated the losses suffered by the EU in the “sanctions war” with Russia at €21 billion ($23.78 billion). In December 2014, Russia’s Deputy Foreign Minister Sergey Ryabkov said the US was “twisting arms” of their own allies so that they could continue an “anti-Russian front” and follow US policies on sanctions against Russia. “But the US is not ashamed of insisting on cooperation with us [Russia] on matters affecting its own interests,” he said. He used the example of the Iranian nuclear talks, in which both Russia and the US take part. Even President Obama admitted that: “We occasionally have to twist the arms of countries that wouldn't do what we need them to do,” in an interview with Vox in February. Even Washington has found the sanctions they have implemented against Russia have not always served their own interests. The US discreetly managed to create a loophole in its sanctions against Russia to allow communications software to be exported to Crimea to try and limit Moscow’s ability “to control the narrative of local events,” according to the Commerce Department, which was cited by Bloomberg. The move comes after the State Department’s former senior adviser for innovation, Alec Ross, mentioned that the Russians have done “an excellent job of flooding the zone in Crimea with their propaganda,” and that the US needed to introduce media platforms in Crimea and Eastern Ukraine, which Moscow would be unable to control.